if the above option has been chosen, what personalised message would like on the back of the block? This Personalised Godparent Thank You Gift makes a lovely Christening keepsake. 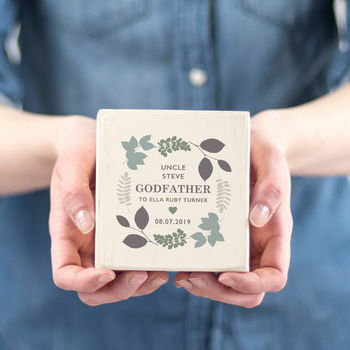 This wooden block is the perfect gift for a godmother or godfather. Buy this delightful wooden Christening keepsake block for a godparent or guideparent to say thank you. Our handmade keepsake blocks make lovely gifts. Personalised with your own wording, our Godparent Thank You Gifts make long lasting keepsakes to treasure. Thoughtful and unique, this personalised thank you gift can be displayed on a book shelf or sideboard in the home. Each thank you gift is made to order with your bespoke wording. 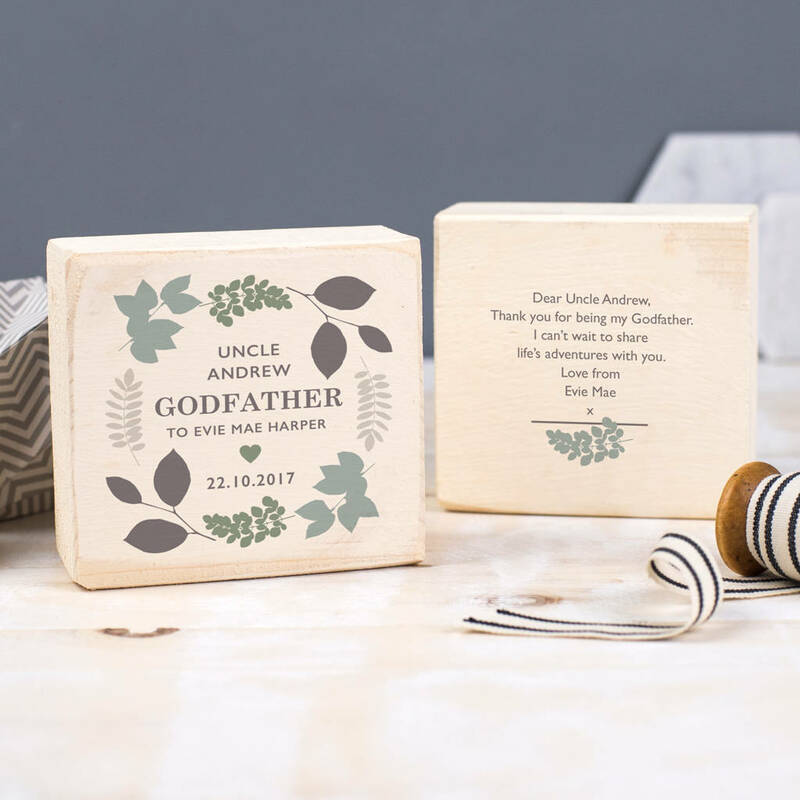 Our small creative team make sure each one is perfect, sent to you beautifully packed, these characterful wooden keepsake blocks make perfect Christening mementos. A great present for a Godparent. 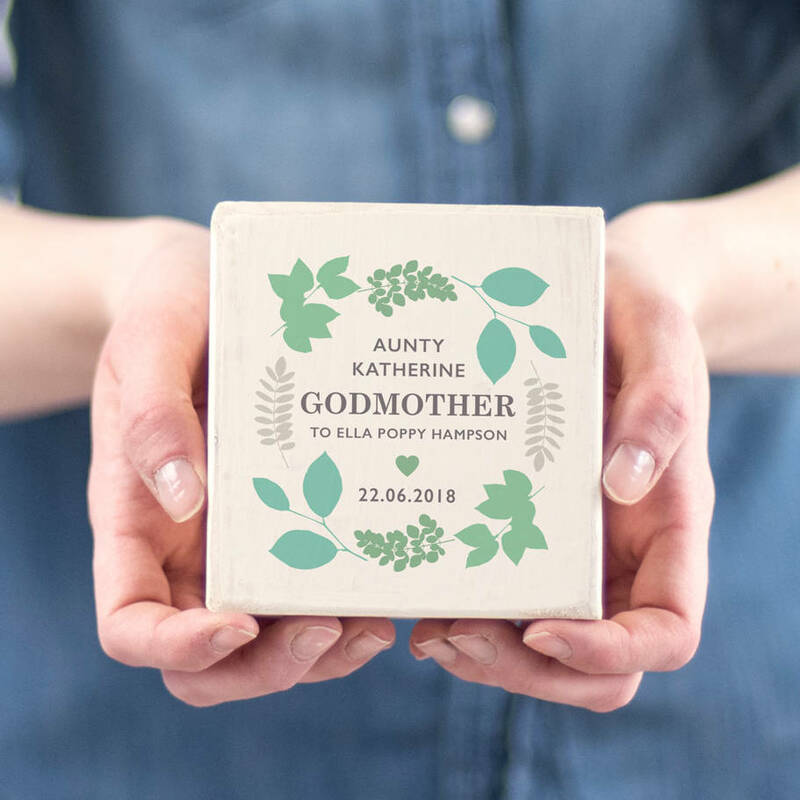 A lovely botanical border is printed onto the cream background of this charming wooden keepsake block. Please choose which colourway you would like this design printing in, greys or greens. After this, please enter your personalised bespoke wording. Add the name of the godmother, godfather or godparents for the top line. Then add the main word to appear in capitals in the middle, this could be 'GODPARENTS', 'GODMOTHER', 'GODFATHER' or any other title. If the title you are looking for is not on the drop down menu, please do get in touch. Add the wording you would like to appear after the main word, for example '...to Evie Mae Harper'. Following this, add the date of the Christening, Baptism or naming day. You may choose to add a personalised message onto the back of the block for a thoughtful touch. 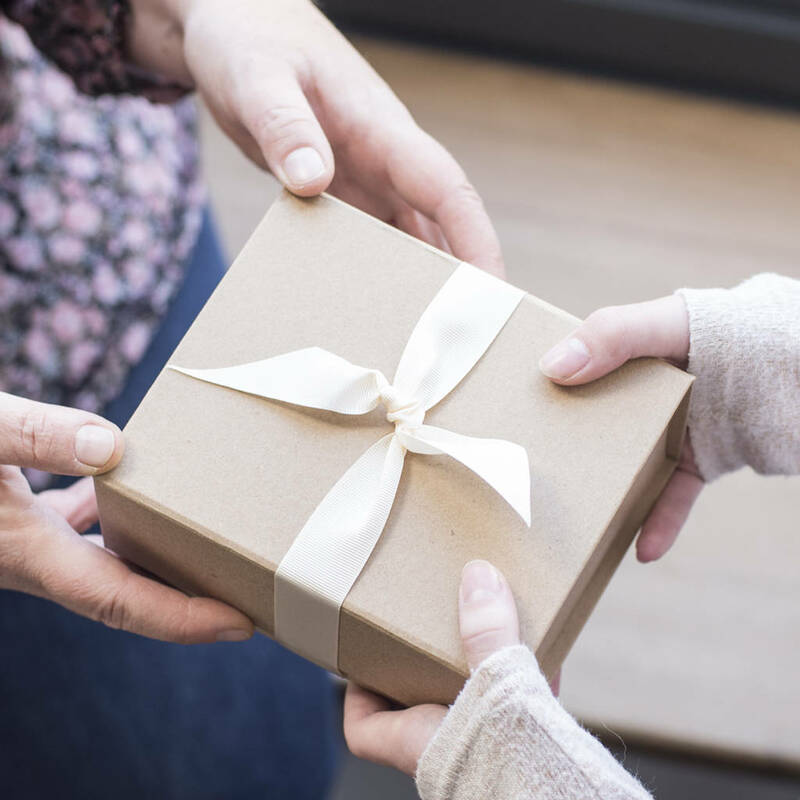 A gift wrapping service is also available to create the perfect present for a Godparent. We realise that often there are several Godparents so you may want to purchase more than one of our Thank You Gifts. Regardless of how many you buy, you will only pay one postage charge. Our Personalised Godparent Thank You Gifts are made from sustainable, reclaimed and locally sourced wood. Painted in cream, each keepsake gift is then slightly distressed for an authentic appearance. Each block has a slightly different texture and patina, making each one unique. Each block is made from reclaimed wood which may have knots which adds to the natural character of real wood. Our blocks have a rustic charm and are not designed to look pristine. Designed as a keepsake and not to be used as a toy. Each block is approximately 10cm square x 3cm thick.